For facility maintenance leaders and workers, it’s crucial to understand how different components of your facility works starting with your HVAC system. Learning and understanding the different parts of your HVAC system will help you maintain your system properly while being able to discover and fix maintenance problems faster, saving you time and money on inconvenient downtime and loss in productivity. To prevent you from future inconvenient maintenance breakdowns, it is essential you have the right tools to keep your system on track. Not sure what you need? Let us help! Did you know that the air filters in your air handling unit are not only the most overlooked components in your HVAC system but also the most important? Air filters are more than just cardboard boxes filled with fibers or pleated material. In fact, air filters affect many components of HVAC performance and comfort. Your air filters’ main function is to filter the air that circulates through your heating and cooling systems. All of the air that heats and cools your facility passes through the air filter in your HVAC system. Keeping clean air filters in reach can ensure that your system will run smoothly and efficiently and that everyone around is breathing in fresh, clean air. On top of that, a dirty filter reduces airflow and comfort and causes the fan to use more electricity to move air. In really bad cases, a plugged up filter can cause your furnace and air conditioner problems because that air flow is needed across the heat exchanger for everything to work as it was designed. Belts in your HVAC system can wear and tear over time, causing your air conditioner to stop working properly, or even at all. To keep your system running in full effect, replacing and changing your belts can reduce the risk of your HVAC not working. Not to mention, an old slipping belt is inefficient and costs money in wasted energy. If you start to hear strange noises in your HVAC system, a common cause could be a frayed belt that needs to be replaced. Contact a professional to help keep your belts in the best condition possible. If you aren’t taking proactive measures to replace your belts before they break, you could be faced with costly repairs down the road. Here’s what you need to know first: not all capacitors are created equal. Any general cooling or heating system requires a capacitor to function properly. The size of your motor will be the determining factor on how big your capacitor will be. Capacitors are necessary for any proper function of an HVAC system, as they are used in air conditioning units to provide starting torque and to improve the motor’s running efficiency. However, the quality of your capacitor is very important to the function of your HVAC system. Using a low-quality capacitor can ultimately damage your motor’s operating functions, or worse, stop working completely. On many occasions, it may be useful to bring a professional technician with the proper tools and knowledge to determine whether or not there are issues with your capacitor. Your HVAC system performs a tough job and things will inevitably happen that affect its performance. One of those things is dirt buildup on your condenser coil. Your air conditioning system is equipped with two basic types of coils: evaporator and condenser. Evaporator coils extract humidity and heat from your facility while condenser coils eject the accumulated heat. Constant buildup can occur as the coils draw warm air out of your facility. Buildup can range anywhere from bacteria, dust, dirt or grease and can create an excessive blockage that will force your coils (and your air conditioning) to work harder and keep them from operating at optimum efficiency. Without condenser coil cleaning, your HVAC will use up more energy than needed to cool your facility. As part of your preventative maintenance plan, your HVAC should be cleaned at least once a year to ensure your system is working smoothly and efficiently. The location of outdoor air conditioning equipment can have an extreme effect on the frequency in which condenser coils need to be cleaned. Buildings located next to areas with high-speed traffic such as expressways, need to be monitored and cleaned frequently throughout the spring, summer and fall. A reliable contactor is vital to your HVAC system’s health. Contactors control how and where electricity is delivered to certain parts of your unit in order to keep you comfortable indoors. When it’s time for a cooling cycle, signals are sent to the contactor. Once it is notified, the contactor is lowered, allowing the electricity to flow through. When the thermostat is ready to finish its cooling cycle, the contractor will raise to stop the flow of electricity to your air conditioning. There are instances that your contactor may not be performing to its best ability. Many contractor failures result from compression damages that aren’t repaired quickly. Contactor replacement is a high-voltage hazard and it is advised that you seek a trusted professional for assistance. Staying ahead on regular preventative maintenance of contactors can help you identify risks and failures before they become a problem. The fuses in your air conditioner and heating system could blow during a malfunction, so replacing them from time to time is necessary. In an HVAC system, fuses are used throughout compressors, evaporator coils, motors and wiring configurations. Fuses not only protect these components from overloading but from overheating as well. Each component serves to complement the function of one another, so if one part fails, the remaining parts will break down as well. As a result, fuses are there to serve your other components from having breakdowns. Keep a supply of fuses for your equipment on hand in case something should blow. Address issues quickly and promptly in order for new fuses to be installed and to get everything back up and running quickly. In some cases, referred to as the “heart” of the HVAC equipment, fan motors are a major component of making sure your air conditioner is properly working. The fan in your AC unit helps to circulate air throughout different regions of your facility. Fan motors in your HVAC system work under tough conditions for years, so overlooking maintenance issues can have serious impacts on your air conditioning unit and the comfort of your occupants. One of the biggest culprits of downtime is caused by neglecting the motor shaft and bearings. Dirt can quickly build up on the bearings and cause your components to overheat due to the motor working harder to produce an effective outcome for your HVAC system. When lubricating the bearings, be careful to not over-grease them. If you aren’t sure on lubrication protocols, refer to your operations manual for the adequate amount and frequency of grease to these bearings. Adopting a routine maintenance or scheduling checkups with a trusted technician to clean, grease or replace the fan motor will prolong the lifespan of your air conditioning unit. With how much we use our HVAC systems, it makes sense that we would do everything to save energy and money. When it comes to the quality and use of your thermostat, it’s important to understand how intertwined your thermostat and HVAC system is. When air temperature becomes too cold or hot, the thermostat is triggered which circulates warm or cold air throughout your facility. To make it easier for users to control, you can program your thermostat in advance or set it manually to the desired temperature. Some heating and air conditioning systems will have more than one thermostat that controls different zones in your facility, helping you to save energy on heating and cooling costs. 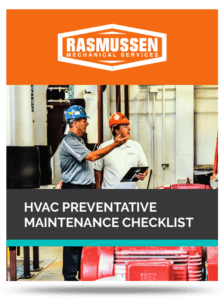 Lagging on preventative maintenance upkeep can cause your thermostat to not heat or cool properly when needed, causing your facilities to become uncomfortable while wasting energy and money. Updating your thermostat will prove helpful to any commercial building owner concerned about their bottom line. When it comes to maintaining your HVAC system, a thermostat replacement is the best and most affordable thing to do. In order to determine if your HVAC system is properly displaying the right temperature in your facility, your thermostat works together with your HVAC system to determine when your air conditioner or heating will turn on. But what happens when you suddenly experience the display on your thermostat showing a low battery symbol? What does that mean and how does it affect your heating and air conditioner? Don’t panic. This just means it’s time to change your batteries in the thermostat. In general, it’s essential to make sure you have batteries for your thermostat on hand at all times. Batteries help you to retain your thermostat settings during unexpected power outages. Many thermostats require a 24 volt C wire which provides power to your thermostats. If you are experiencing low battery warnings in your digital thermostat, a common cause may be underlying issues that are preventing your heating and cooling system from working effectively and efficiently, which may mean you need to call an expert to assess the problem. Many of these items may not be supplied by a local distributor and may have to be shipped by the manufacturer and can take anywhere from 24 hours to over six weeks before the parts arrive. Keep a few of these items on hand. This provides a cost saving opportunity because you avoid expedited shipping costs and reduce the possibility of cascading failures. All-in-all, keeping an up-to-date maintenance list of all the different parts for your HVAC system will help ensure that everything is operating at full capacity. Need a little assistance on proactive and preventive solutions to keep your systems working? Contact our experts at Rasmussen Mechanical Services today!